Features: Report Card: How did the Lions rate? The 2009 British & Irish Lions tour of South Africa produced a feast of top-class action that will live long in the memory of some while others will be happy to forget it altogether. As the dust settles on 'rugby's last great adventure' we take a look at the winners and the losers from the last six weeks. The Lions' head coach was unable to conjure another famous series victory but, along with team manager Gerald Davies, deserves huge credit for restoring credibility and stature to the Lions' brand. His skilful man-management is legendary and the team spirit he fashioned in five short weeks is testament to that. He has ruled himself out of touring with the Lions again but if he remains in the game he will have a compelling case to be coaxed back on to the plane come 2013. 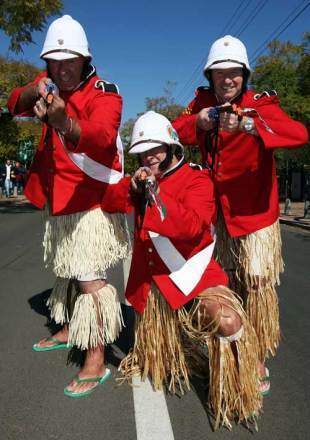 The Lions' supporters descended on South Africa in their thousands and once again added colour, passion and humour to the match-day experience. Although they didn't travel in the number originally expected they still managed to leave an indelible mark on the tour and drink many establishments dry. They remain an integral part of the Lions' brand and their unstinting support is truly remarkable. The Springboks captain once again underlined his unquestionable leadership prowess by steering the hosts to a series victory over the Lions. He also answered those who doubted his ability to excel as a tight-head by more than holding his own. The 31-year-old is equally assured off the field in front of the media and rescued his coach Peter de Villiers on more than one occasion. Aside from his decision to endorse the armband protest against the ban imposed on team mate Bakkies Botha, he commands respect from all his peers - including his adversaries in red. Any talk of retirement should be laughed off. The Lions' first-choice centre pairing were a resounding hit for the tourists until injury ended their respective tours ahead of the third Test. O'Driscoll was inspirational on the field and hailed by skipper Paul O'Connell as not only the key to the Lions' attacking fortunes but also the heart of their defensive effort. The Irish veteran's leadership skills were also a bonus not least in guiding Roberts' ascent to the pinnacle of world rugby. The strong-running Welshman was a constant threat and was rewarded as the Lions' Player of the Series. This tour was all about the Lions embracing their traditional values and repairing the damage of four years ago. The spirit within the squad and the improved relationship with the media would suggest that they have succeeded in that quest. The Lions, in many ways ambassadors for the game, were also keen to ensure that they left a genuine legacy behind in South Africa. With the help of their main sponsor, HSBC, the Lions have also hit that target with what they claim is the world's biggest schools rugby programme. The Lions are back. The Irishman was looking assured in his early outings and it was a close call between him and Welshman Stephen Jones for the starting No.10 berth. But when the Lions' management settled on Jones as their first choice, O'Gara was destined for a bit-part in the Test series. However, his 12-minute cameo in the second Test took on epic proportions. First he bounced off South Africa's Jaque Fourie to allow the centre to score and then he conceded a fatal penalty that fly-half Morne Steyn slotted over to give his side the win and the series. 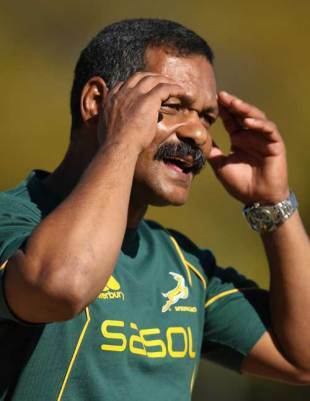 The outspoken Springboks coach did not make any friends with his decision to withdraw his leading players from the provincial warm-up clashes and will have alienated even his staunchest supporters with his comments in the wake of the Schalk Burger eye-gouging or 'contact with the eye area' incident. His union bosses were forced into an apology in a bid draw a line under the matter but de Villiers continued to court controversy. Ruled out of the first Test by injury the Stormers flanker returned for second Test and was given the honour of leading the side out on the occasion of his 50th international appearance. Sadly, he was jogging back to the touchline with less than a minute on the clock having clawed the face of Lions winger Luke Fitzgerald. He was subsequently banned for 8 weeks and apologised to his team but not Fitzgerald. The host union claimed that they were the victims of the global economic downturn but even so you cannot help but think they were being a little greedy with their ticket pricing policy. Tickets for the Tests were one sale for R1,140 (£88) while a Tri-Nations ticket will cost at most R450 (£35). A midweek Lions game would set you back R230 (£18) as opposed to a Super 14 match, for which a ticket can be yours for R50 (£4). While these prices may not look too inflated to a Lions fan who has already spent thousands to join the tour, for a South African fan they are outrageous - 'once in a lifetime opportunity' or not. There is little wonder that there were so many empty seats to be found throughout the tour. The citing and subsequent banning of Springboks Schalk Burger and Bakkies Botha did not portray the sport's judicial system in the best light. Botha's suspension - for a dangerous charge on Lions prop Adam Jones - was immediately appealed by South Africa and their case drew support from the Lions and Jones himself who saw little wrong with the lock's actions. They claimed - correctly - that similar incidents go unpunished week in, week out but it was to no avail. The report into Burger's indiscretion also highlighted a cringe-worthy grey area when it comes to classifying what is widely regarded as the most heinous crime in the sport. Burger was found guilty of 'contact in the eye area' and not eye-gouging as was widely reported. But can you tell me the difference?